Are you afraid to flash your smile because you have suffered the loss of a tooth? Thousands of Americans lose teeth every year due to a number of factors, including tooth decay, facial trauma, or severe injury to the mouth. The loss of a tooth is not only frustrating and painful, it can cause serious damage over time if not treated as soon as possible. 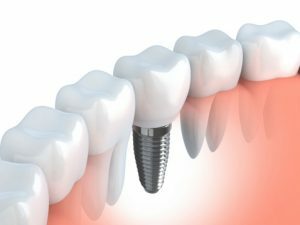 There are several different treatments to replace a missing tooth, but the most popular and effective procedure comes in the form of dental implants, which are offered by Aspen Dental Care, located in Ft. Collins, CO. Your jawbone requires stimulation throughout the day. It receives this stimulation from your teeth, as they make constant contacts (chewing, pressing against each other, etc.). When a tooth is lost, the stimulation in that area is no longer present. Over time, the jawbone will begin to lose mass, height, and width. In order to prevent any adverse effects of a lost tooth – besides the obvious pain and difficulty chewing and speaking – dental implants can rectify the situation and restore function and form to the mouth. Our stellar doctor and team of experts have the experience and technical prowess to provide a straightforward, painless treatment. When you arrive for your initial consultation, we will take impressions of the problem area and plan out the procedure. We will surgically implant a biocompatible titanium post in the jawbone. You will undergo a healing period, as the bone grows over and naturally accepts the post, and the gums properly heal. When healed, you will return to our office for the final part of the treatment. We will bond a durable, strong replacement tooth to the post, cementing it within the mouth. After the procedure, you will be able to walk out of our office with a complete, healthy smile. A missing tooth is a terrible burden, but Aspen Dental Care is here to help. Call us today and set up your initial consultation with our phenomenal staff. Our office doors are always open to those who live in Ft. Collins, Co, Wellington, Bellvue, Loveland, Windsor, and the neighboring communities.